First and foremost my apologies for not posting in some time. Unfortunately I got diagnosed with leukemia back in March which has prevented me from creating more recipes in my kitchen. I could go on and on as to how I could improve hospital food, only if it were as simple as a spice or two, but I am not going to go there. I’m just happy to be home with my wife and kids, and to be able to be back in the kitchen when my energy permits, and this past week was probably one of those good weeks with as much energy as I think I may have over the next few months. It’s funny the first thing I did when I came home was make a meal for my family. Thai basil chicken to be exact. Granted we were blessed to have family and friends bring over meals for my family as I was laid up in the hospital, whether that be of gift cards, casseroles, or other homemade goodies; my wife and kids (and I) were so very thankful in receiving all of the gifts during the challenging time, but being able to whip something up in my kitchen felt oh so good, and let’s just say my wife and kids loved the spice and flavor impact of the Thai food. So I had a small amount of time on my hand this past week, and I decided to whip up a dessert I knew my wife and daughter would love (and hoping my boys would take down), and that was a rhubarb and blueberry streusel. This recipe is so easy to make, and makes excellent use of rhubarb, something that is perfect right now and is in season this Spring. Butter. I know. It probably makes this recipe so delicious. Not only that but the combination of rhubarb and blueberries, along with the light brown sugar brings this one together. Cut into bars, these are addicting. Trust me. Start by preheating your oven to 350°F. Line it with parchment paper and spray with cooking spray. This helps with removal and slicing when it is done cooking. Combine the blueberries, sliced rhubarb, lemon juice, and 1/4 cup of the sugar in a large bowl. Set this aside to macerate while you make the crust and streusel. I love macerating. Place 2 1/2 cups of the flour into a food processor. Cut the butter into large chunks and add to the flour along with the cream cheese, salt, and remaining 3/4 cup of the light brown sugar. Pulse to combine the mixture until moist and crumbly, with no chunks of butter remaining. Remove about 1 2/3 cups of this crumbly mixture from the food processor and set it aside for the streusel topping. To the rest of the mixture still in the food processor, add the remaining 1/4 cup of flour, whole egg, baking powder, and vanilla. Blend until it just starts to come together to form a dough. This should only take a minute or two. Press the dough evenly into the lined pan (it’s easier to do this if your hands are slightly damp). Bake for 10-15 minutes. I use a glass 8×12 pan a few inches deep. Strain the macerated fruit to remove the excess liquid. Spread the fruit in an even layer over the surface of the partially baked crust. Sprinkle the reserved streusel topping over the surface of the fruit and then sprinkle on a little more light brown sugar. Bake again for 40 to 50 minutes until the topping is golden-brown. Let the pan cool for 20 minutes before lifting out of the pan using the parchment paper. 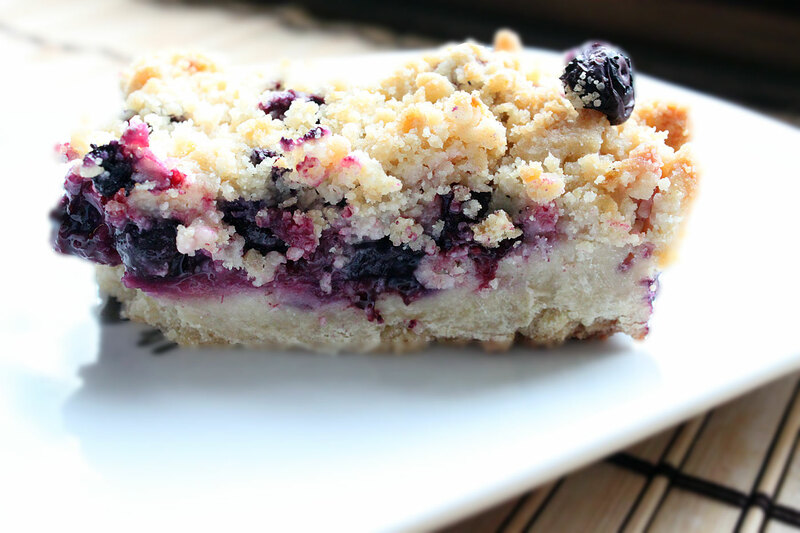 Let the streusel cool, then slice into squares. Take square. Take a bite. BACK AWAY FROM THE STREUSEL. THEN BACK UP TO IT AGAIN AND GRAB ANOTHER SQUARE. This is how it goes with this dessert, it’s that good. 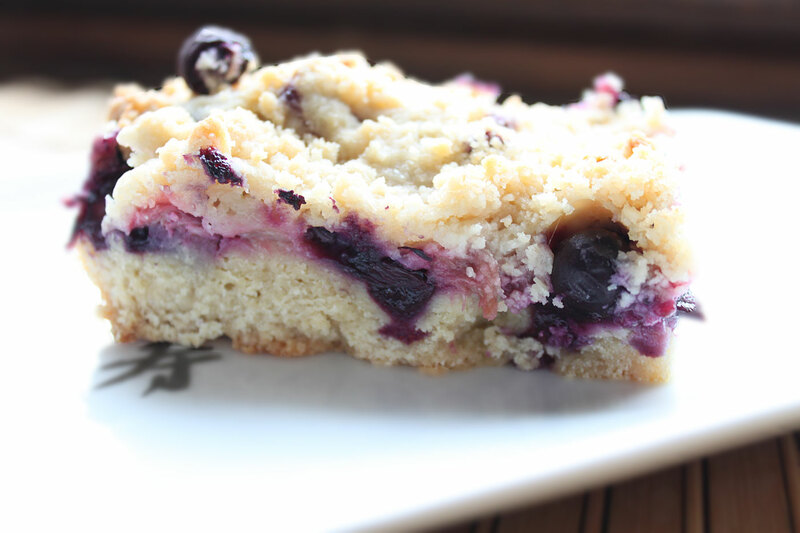 If you are looking for a super simple dessert, one that is seasonal, and one that is darn right addicting, you will have to give this rhubarb and blueberry streusel recipe a try. Thank you for the rhubarb recipe just in time for me to make this recipe. My Rhubarb is ready. Nice to have a new recipe. Hope you continue to feel better and thanks for sharing this recipe. I love anything with rhubarb! I made the streusel last night for Jerry and it’s fabulous! Enjoyed some of it today at lunch and will definitely be making this again and again! Hi Paula! Glad you and Jerry enjoyed it. I could use a bar of that right now. We loved it. We used your rhubarb last week to make a quick jam. Great stuff. Hopefully see you guys this weekend.